CQ WW RTTY is the perfect excuse (if you need one) to turn on the amplifier and have a play with the big boys. Its never been more popular, no longer do you need a separate room for your RTTY teletype printer just a PC and some logging software should be fine. I have in the past completed most of the 48 Hrs as part of a team, making thousands or “QSO” but this year was a much more relaxed casual event. The plan was to grab a few hrs operating over the weekend, in between the usual tasks. The linear would allow 400w RTTY with around 5w drive, to the doublet antenna. The doublet is 10m per leg, and fed with 30 Ohm ribbon it doesnt make a very nice match on 20m ! The alternative antenna is a 8m vertical with an auto ATU at the base. The CG5000 is a 800w PEP remote auto ATU, although I dont use the amp with this antenna and choose to run 200w barefoot from the TS990 in this configuration. Remote ATU near the base of the antenna are hard to beat if you haven’t got a resonant antenna, helping to reduce large mismatch in the feeder and the subsequent loss of power. One disadvantage is they need to be powered, the CG5000 requires 12v and isn’t equipped with a bias tee. This requires a separate power cable to be run to the bottom of the garden, fine in my postage stamp but maybe an issue if you own 2 acres ! After spending some time on the bands it was obvious 10m was closed, 15 was a little better but as usual the “easy band” 20m was open and provided some of the best contacts. In total I worked 132 Q in 42 DXCC, using SH5 to analyse the log. The program can be used to check and map many of the stations you work, allowing you to gain a great insight into your operating and in some cases multi operating / radio station. 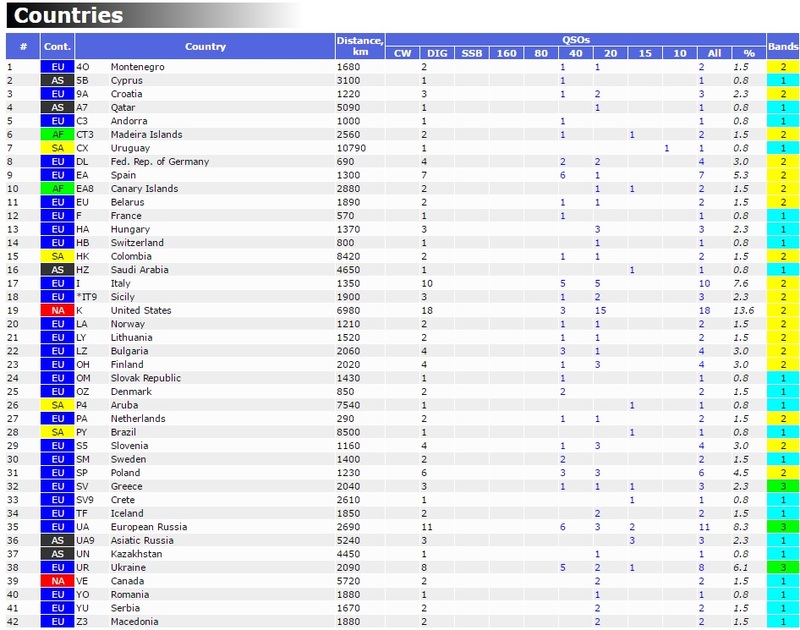 Here you can see a basic list showing DXCC worked. 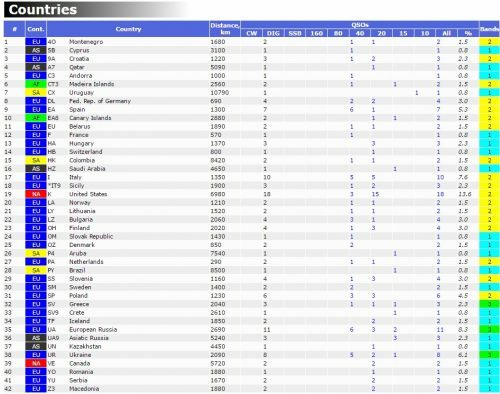 The mast files contain information on and the location of many of the regular DX stations, and so distances and bearing information can be analysed in tabular and graphical format. RTTY and logging was provided by the excellent N1MM software, as usual its a real credit to Thomas for a massive free contribution to amateur radio.